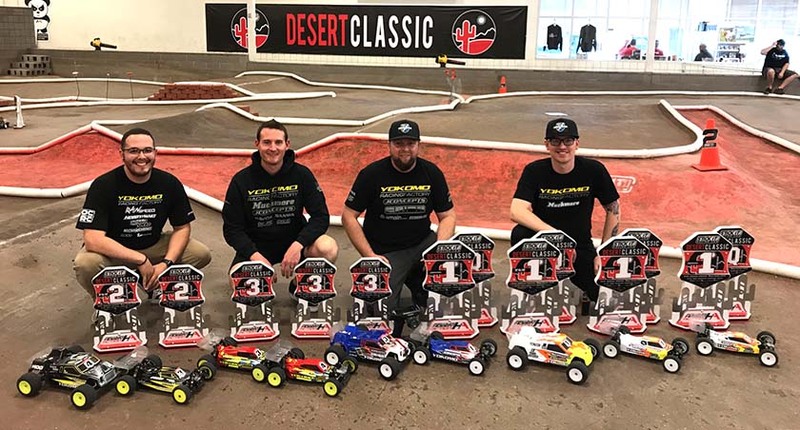 Yokomo's Ryan Maifield & Jake Thayer Win BIG @ 2019 Desert Classic in Arizona! The 2019 Desert Classic was held March 7th-10th at the amazing facility of Hobby Action R/C Raceway in Chandler, Arizona. Yokomo would arrive at this years race with a stacked team consisting of: Ryan Maifield, Ryan Cavalieri, JP Richards, Jake Thayer, Riley Schaefer, Josh Bend, Ethan Kovalsky, Ron Reid, and Brady Anderson. Also in attendance for Yokomo was lead engineer Shin Adachi and USA Team Manager Joe Pillars to provide top notch support to all Yokomo team drivers and customers. With over 300 total race entries, it was going to be a great weekend of racing! In the highly competitive 4wd Modified Buggy class, Yokomo’s Ryan Maifield dominated qualifying and secured the overall TQ with his YZ-4 SF! Maifield then took the convincing Wins in A-Main #1 & A-Main #2, to take home the 4wd Modified Buggy Championship! Yokomo’s Ryan Cavalieri showed great speed and would finish 3rd overall on the podium! In the 17.5 Stadium Truck class, Yokomo’s Jake Thayer would go onto take the overall TQ honors with his YZ-2T! Thayer then put in an impressive drive during the single 8-minute A-Main to take the Win and the 17.5 Stadium Truck Championship! Yokomo’s Riley Schaefer also put in a great drive to finish 2nd overall with his YZ-2T! In the 13.5 4wd Buggy class, Thayer went on TQ 3 of the 4 rounds of qualifying to take the overall TQ with his YZ-4 SF! Thayer then went onto dominate the single 8-minute A-Main by leading every lap to take the Win and the 13.5 4wd Buggy Championship! Schaefer would put in an impressive late race charge and make his way up to 2nd with his YZ-4 SF! In the 17.5 2wd Buggy class, Thayer went onto TQ rounds #1 & #3 of qualifying to take the overall TQ! Thayer put in an amazing drive during the single 8-minute A-Main to take the Win by a comfortable margin and the 17.5 2wd Buggy Championship! This completing the perfect SWEEP for the weekend!